What is a Sand Art Wedding Video? Sand Romance presents a unique wedding video idea – sand painting. This is a form of painting or drawing that makes use of sand, colored powder or minerals to produce various art pieces on surfaces. It’s amazing to see the artists pouring sand from their hands and create various pictures with the help of their hands, nails, fingers and other tools. These pictures will include you and your fiancé, the places where your love story started and flowed, how your fiancé proposed you for the first time, how and where you met again and again and ultimately how you tied the knot. The wonderful animation in the video is accompanied by an equally wonderful music perfectly fit for the romance the video contains. 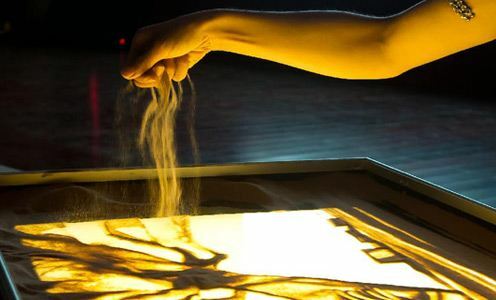 Sand paintings can be fixed or unfixed but they become a whole new enchanting idea when presented in the form of a video. These videos contain a series of paintings drawn on a plain surface in a continuity that will leave you stunned. The paintings are constantly overdone or removed and other paintings take their place creating a superb video. The ease and skill with which the artist goes on drawing new images with sand are indeed eye-popping. 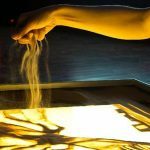 Instead of a typical wedding video, this innovative sand painting wedding video is sure to capture your guests’ attention and will make you feel proud and pleased while watching it for years to come. The process of getting such a wonderful video of your wedding event is really simple. You have to request a free quote from Sand Romance. You will then get a detailed worksheet from them to help you send them the information they want. Then their designer starts working on your project and plans every scene for you. They will send you samples of each scene and you can make changes to them if you want. Upon creating a perfect video just as you wish, they send you the final video. So, are you ready to get this outstanding type of wedding video? Get it for your big day and show to the world that you and your partner are a unique couple!